In our ninth edition of the Donut Dollie Detail, Ellen Cadden Nagy tells how coming from a military family and wanting to see and experience the war up close led her to becoming a Donut Dollie, details the “close calls” she experienced, and explains the challenges of visiting wounded soldiers at the hospital on Monkey Mountain. I had been out of college for 2 years and wanted to do something more meaningful with my life. I went to the University of Georgia and majored in Journalism in 1968. I had read extensively about the Vietnam War and wanted to see/experience it up close myself. And, of course, the war was on the nightly news every day, as well as student unrest and protest. I had come from a military family (as many of the Donut Dollies were), my father was an officer in the Army. My dad died when I was 11; he had served in WWII in the European theatre. I felt the Red Cross was a way to serve my country. I was stationed in Vietnam in 1970-1971 at Bien Hoa (1970), Da Nang (1970-71) and Long Binh (1971). I was known as Ellen Cadden at the time. My first assignment in July 1970 was in Bien Hoa (Army) with a small center, base runs/programming (Army and Air Force), and forward runs (Army, Navy). The center was open till later at night, can’t remember but maybe till 10:00 PM. There was kool aid, coffee and coffee cake available. This was a small center and had a few game tables and (1 or 2) pool tables. This was a small unit of 6 DD’s and we lived in a Quonset hut. We once programmed to an entire ship from the dock at Vung Tau and then later served lunch from the galley – It was over 100 degrees, but it was a terrific run! Da Nang Sept 1970 – March 1971, unit of 12 DD’s. This was one of the largest units in country. We programmed to Army, Navy, and Marines (until the Marines went home in December of 1970). Two girls flew to Quang Tri from Monday afternoon till Friday each week – from there we went to forward units close to the DMZ. Some time in 1971, they opened a unit in Quang Tri. The Red Cross Center, a very large building with two game rooms (pool tables and foosball tables), a music room, a library, coffee, kool aid and coffee cake counter was on Freedom HiIl and with Special Services, USO, a post office and PX. The center was only open during the day – Freedom Hill closed at 5:00 PM. We had base runs and flew to fire bases/LZ’s all over the mountain region. We first lived at Camp Baxter in what was once a hospital and nurse’s quarters. In late 1970 or January of 1971 we moved to the headquarters of XXIV Corp and lived in a two story base housing type building. Long Binh 1971, this was only a forward unit. There had been a center earlier in the war. I actually liked the mix of a center and forward runs better. This unit was only 6 girls and we lived in trailers. I never served donuts nor did we take coffee and donuts on any runs when I was there (that I remember). 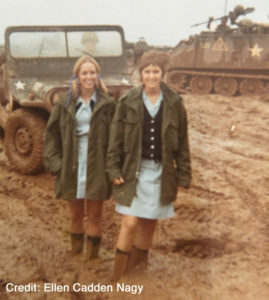 But, we did serve meals in mess halls; Thanksgiving 1970 two of us were on a firebase near the DMZ and served a special meal sent from their headquarters. Many days we were up at the crack of dawn and at the heliport waiting to be picked up for the day. We often did not return until nearly dark – long, hot days. We would be back up the next day, happy and ready to go again! On a firebase on a run out of Da Nang, the firebase took incoming and there was a fire fight. They called in gunships, and we were evacuated immediately. One night in Quang Tri there was incoming and we had to go to a bunker for several hours – it was cold and monsoon. On a jeep run outside of Da Nang we were fired on and got down on the floor of the open jeep. No injuries. I felt safe with our military support. The only hospital experience I ever had was at the hospital on Monkey Mountain. The hospital doctors asked for volunteers to come and see the critically injured men after surgery and before shipping out to Japan for extended recovery before going stateside. So on a day off, Sara Porter and I went (I don’t remember who else went that day, but there was just a few of us). The men just out of surgery were so badly injured and we were not equipped to witness these type of injuries. We were told “we could not cry under any circumstances” and that our reaction would set the tone for them in their recovery process and how their families would see them. Men were missing limbs (many hands, arms and legs), eyes, parts of their faces, and brain injuries. They would say they could not feel their hand or arm or leg and ask if they were still there. I felt like my heart was ripped out. We did not cry until we left. Hospital visits were not part of our programming when I was there. I see from other DD’s earlier in the war, that it was a regular occurrence. It was very difficult coming home after being in Vietnam. Vietnam became your world. No one was really interested in hearing about my experience. The only thing people were interested in was ending the war. 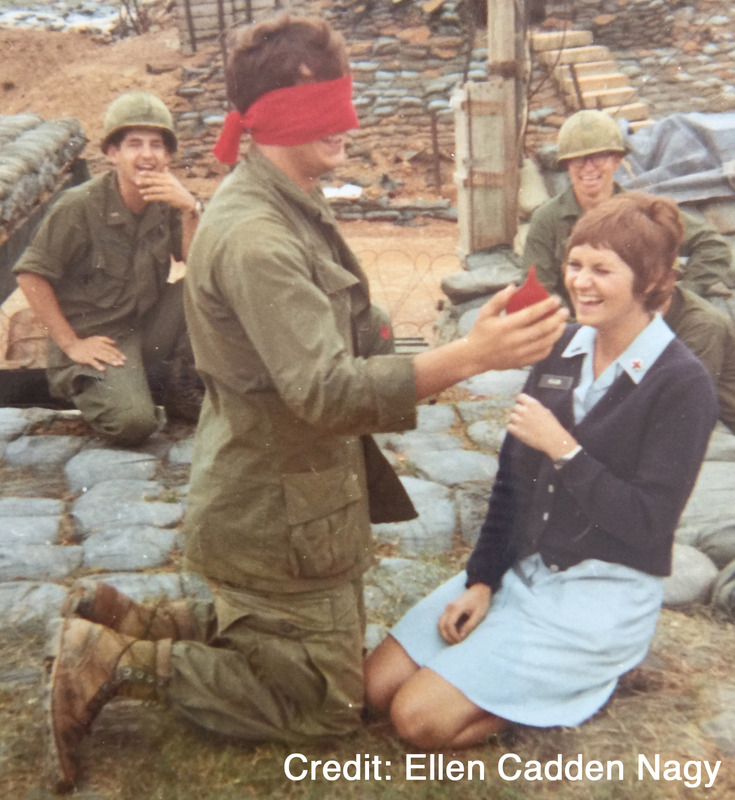 I married a GI I met when I first came in-country to Bien Hoa. We have been married for 46 years (he now has non-Hodgkins Lymphoma – Mantle Cell Lymphoma associated with Agent Orange). We both still get a familiar feeling/rush when we hear a helicopter or see a C130. In 2013, my husband and I went back to Vietnam. My husband didn’t really care about going, but it was healing for me. The cities are thriving – Saigon, Da Nang is amazing, the beaches have 5 star resorts, but the countryside is little changed with the exception that everyone has a cell phone and so many scooters. It is very interesting that there is a revival of interest in the Vietnam War and the untold story of the 627 Red Cross women that served with our brothers. It was a privilege to be there and contribute in some small way. To bring a smile and talk with the young boys – really mostly 18 and 19 year olds. They shared their stories of home, laughed at our silly games, and looked forward to hopefully seeing us again. They shared their rations of cold sodas on beastly hot days. They were in awe that we came to be with them – “round eyes.” I never regretted a day that I went, just wish I had gone even earlier. The war was beginning to wind down the latter part of 1970. The experience was the same, but different over the years. The bond between DD’s was and is very special. After all these years family is more interested than ever before and want me to talk to them about my experiences. I share two CDs that I have – “A Touch of Home’ and “A.K.A Donut Dollies.” Those give a glimpse of what we did. I just recently showed “A Touch of Home” to my sister-in-law and brother-in-law; they both cried and apologized that they never asked before. I had hundreds of slides that I threw away about 8 years ago because I really felt no one was interested in the DD story or cared, so in a cleaning moment I threw them all out – I regret it now. I am married to a Vietnam Vet and vet friends that experienced programming are very appreciative; however, some never saw a DD and didn’t know we existed. In December 1970 Bob Hope came to Da Nang and my now husband was able to get an in-country R&R and came up. We were able to see it together. I wish I had written all the DD’s names down everywhere I was stationed. I also wish I had journaled my experience because after nearly 50 years I can’t remember things I wish I could. Another memory was from an Army vs Navy touch football game that was organized by some men for patients at the hospital. 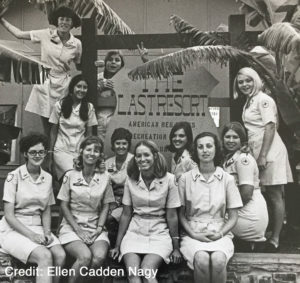 DD’s, Special Services and USO gals were cheerleaders. I participated as a cheerleader for the Army who won 32-0. The patients that could come outside were able to be spectators. It was great fun. Sara, I had hoped to hear back from you and touch base again. I live in SC and thought someone told me you lived in NC. I was just in San Antonio on vacation and had lunch with Sheila Shanahan – first time I have seen her in 46 years. While you were burning up in Vietnam I was freezing in Alaska. We kept all the Vietcong out of Alaska. Not a one got in!!! P.S. My brother was majoring in journalism at UGA in 1968. Thx for sharing your experiences. Ellen, thank you for your Service and Welcome Home! Ellen, thanks for sharing your story of being a Donut Dolly! That was quite an adventure! How I remember that football game! I was on my second year, with Army Special Services, so was a cheerleader for the Army side, obviously. But I believe that all of us, USO, Donuts, and Service Club Girls, had a marvelous time! 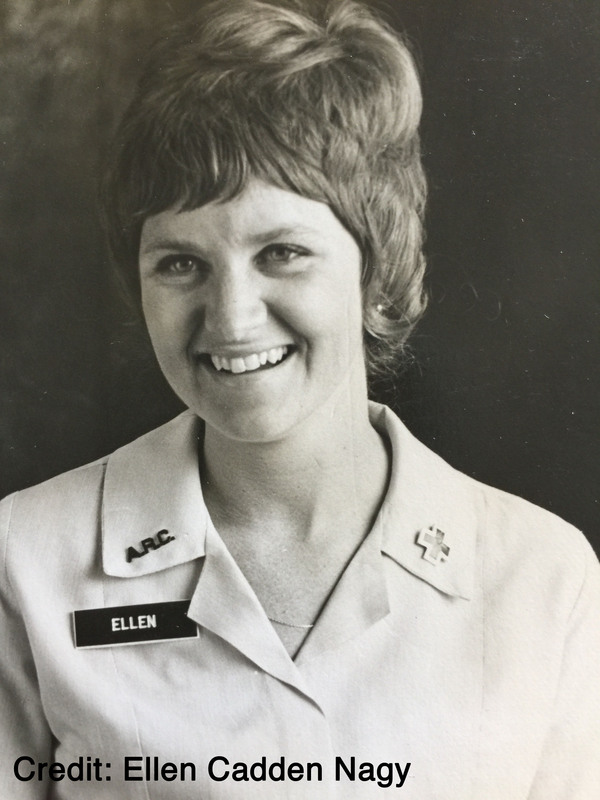 You ran a great unit at Danang, Ellen, even though I have some mashed-up memories. Polly, Sara, Fran, Pat …….. ya’ll had a big job and you did it well!! Hey Ellen. I cried again just reading this. I regret not asking you more about your experiences and am so very grateful you’ve had a chance to share your story now. Joyce Rice Denke and her hubby, Dwaine and a friend just visited us here in Australia. Joyce and I had a great time talking about our experiences and how different they were in some ways, but similar in others. I see she was in your unit at Danang. I was with you in Long Binh and like you I have no regrets about my year in Vietnam. Except I didn’t write down names and stateside addresses either. Thank you for sharing your awe inspiring, if difficult, experiences, Ellen. Thank you for your service to our young military men. You and they accomplished difficult tasks through your loyalty to our country and your hard work. You and your husband, Allen, are assets to our church and community, just as you were assets to the military and the Red Cross, then. Again, thank you.. Thanks for the Kool-Aid. A bright spot in a terrible place. 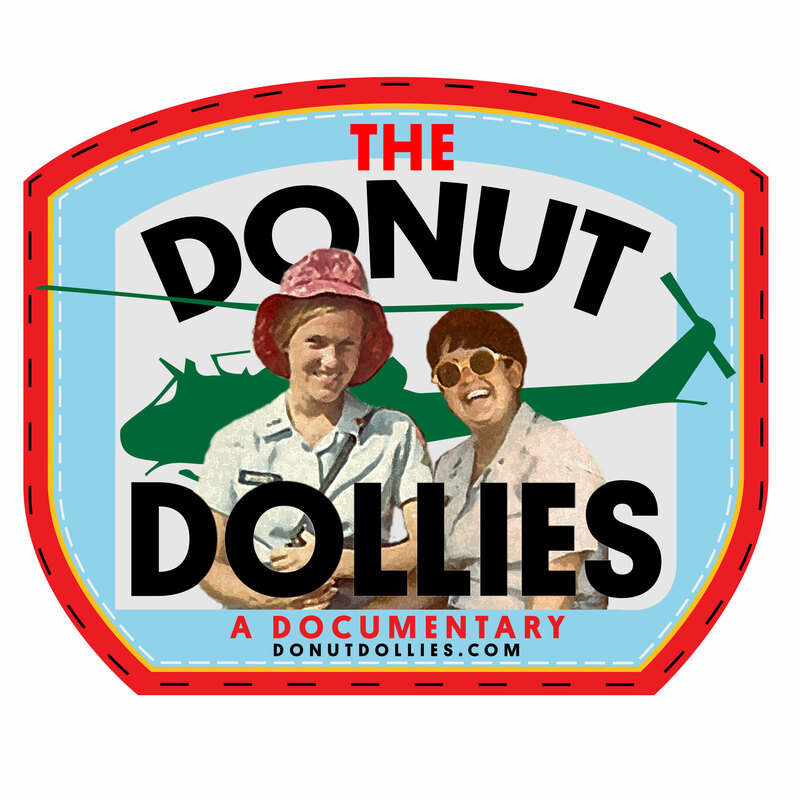 Thank You and all the Donut Dollies who visited us lean and grimy youngsters on the primitive Firebases in I corps in 71. We loved that you made the sacrifice to bring a coke and a silly game, and you all were a bright reminder of those we had left behind back in The World, and what we hoped to go back to. Slow Rendered Hand Salute from former Spc. 4 101st Abn Grunt. Again, Thank You. Thanks for the collaide..A bright spot in a terrible place. In 1970 we had DDs visit our Combined Action Company HQs about once a month beside Highway 1 a few klicks south of Danang. There I met a DD named Marsha R. from my home state of Kansas. It was fun meeting somebody from home and I enjoyed the games we played and talking with the DDs. I also ran into Marsha at least once at Freedom Hill. When she went home she took the trouble to call my parents and tell them she’d seen me and I was fine. They were incredibly grateful for her gesture. Sam Flint 173rd Aslt Hel Co Robinhoods. 66-67. God love you all..